Although blended learning is touted as widespread and effective, few theories and models exist to explain what blending is, determine an ideal mix of various delivery media, and guide the practice of blending. After reviewing several definitions and models of blended learning, the authors present a conceptual framework for strategic blending, entitled Strategic Blended-Learning and Performance Solutions (SBLPS). It defines strategic blending as a purposeful mix of delivery media (particularly face-to-face and various forms of technologies) to improve learning/performance solutions, which are derived from the goals and needs of an organization. This framework proposes five procedural, interrelated phases that create strategically blended solutions for both instructional and noninstructional situations. Yoon, S.W. & Lim, D.H. (2007). Strategic Blending: A Conceptual Framework to Improve Learning and Performance. 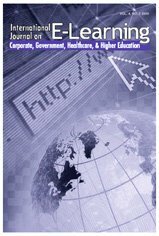 International Journal on E-Learning, 6 (3), 475-489. Waynesville, NC USA: Association for the Advancement of Computing in Education (AACE). Retrieved April 23, 2019 from https://www.learntechlib.org/primary/p/21033/.